For some of us, our outfits, the combination of colors we choose to adorn ourselves with or the kind of prints we usually stick to is a kind of recreation, another medium to express ourselves. Fashion is always on; everyone tries to be with the flow and to adapt something new. There is no particular guideline for that rather does get ready in something which suits you. Ralph Lauren had once rightly said, “Fashion is something that comes from within you.” What you choose it wear may be your armor to cope with the monotony of routine: real and ubiquitous. These are in vogue nowadays. Stylish and very summery, fringe and tassels have been around since the Country has been a vital part of mainstream culture. So it’s not particularly feminine because men wear fringed sleeves too and it has been around for quite some time. This summer, fringed bags and dresses can be pulled off very effortlessly if worn right. They are versatile and there are no restrictions for lengths and they can be however long and short you want them to be; as high as thigh slits or even higher. If dark shades and long dresses are your thing, this might be the thing for you! Perfect for carnivals and other festive occasions, paired with ankle boots and over-sized shades, fringes can create a very fashion forward look. For enthusiasts of lighter, pastel shades, they can be modified into subtle off-shoulders or long skirts and worn at beaches or on holidays. It will appear very breezy and boho chic teamed up with flip flops or hats. Tassels, on the other hand, looks funky when attached with bags but also has a very Indian connotation. Tassels at the end of dupattas are extremely reminiscent of how our mothers and their mothers used to dress. Not only clothes but also curtains are tasseled as well as other household decorations. 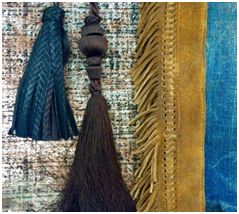 At Trimworld Inc., a certified business with NYC, tassels can be cut, looped, beaded or leather.Tassels heads may be beaded, gemmed, wrapped or metal. Dyeing is always fun and it can have very eccentric results whether its hair, clothing or custom made articles like buttons. At Trimworld Inc., they have an In-house dyeing room. Trim dying is a specialty and they take care of special orders; samples and small lot dying needs like fabric, Trim and buttons as well! Since school days we have been sporting pleated shorts and skirts. Who knew they would be one of the top trends nowadays? Pleated maxi dresses, midi length skirts, tops, they’re very versatile. A conventionally feminine style, pleats are neat but can be glamourous if matched properly. A tight fitting crop top or a denim jacket along with pleated skirts can take an outfit to another level. 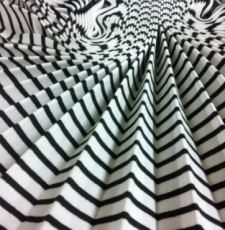 At Trimworld Inc., the highly skilled staff is experienced in machine and table pleating a wide variety of fabrications.Crystal pleating is very trendy too; the folds look crisp and neat. They offer all styles of pleating and even custom patterns as per the demands of their customers.